Blaster Bash makes your party unforgettably fun. We bring laser tag to you. Let's face it, these days it takes a lot more than pin the tail on the donkey to keep a kid's party interesting. Throw a party your child and their friends will remember for years. Make it a Blaster Bash! 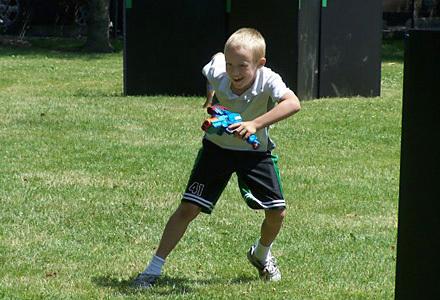 Our video game inspired game types let teens play out familiar video game scenarios right in their own back yards. Why let the kids have all the fun? The competition, strategy, and teamwork of laser tag make it fun for all ages. Blaster Bash serves the Twin Cities, MN metro and surrounding areas.